Create a responsive tribe of ready buyers through email storytelling. You’re probably here because you’re a blogger, influencer, solopreneur, or a startup who wants to generate a reliable income stream online. The idea of running a profitable business from the comfort of your own home is very alluring. Time freedom. Financial Freedom. Location Freedom. You may be just starting out, have a good size audience, or even be considered an influencer but you’re struggling to translate that into sales. You’re afraid to even start because you’re worried that you’ll run out of topics to write about. Yuck! You don’t want to be seen as a pushy salesman so you’re hesitant (even unwilling) to sell even if you know that’s the only way you’ll make any money. You jump from one training to another leaving you more confused about running an online business than when you started. We’re not in this for the money. Sure, that’s part of it. What we’re really after is POWER. The power to be there (both physically & financially) when a loved one falls ill. The power to attend all our children’s milestones, without feeling guilty for leaving work. The power to check off our life’s bucket list one thing at a time because time is a gift & it can be taken away in an instant. Simply, the power to live life the way we want to. I believe everyone has the ability to self-generate revenue by creating a positive impact in other people’s lives through the power of email storytelling. I’m Allan Ngo. At the age of 25, I suffered from “Quarter Life Crisis”. Yes, that’s a thing.I’m stressed out from my corporate job. My franchise business was falling apart. My personal life was in a toxic stage. That's when my best friend and I started talking. You see, whenever our birthday approaches (our birthdays are 2 weeks apart) we’d talk about where we are in our lives. And if we’re happy about it. We decided on a whim to apply to a scholarship program that would allow us to study and live abroad for a few months. I never got accepted in any scholarship program before so if I got in, I’ll treat it as a sign from God. To my surprise -- I was accepted! So I quit my job, packed my bags, and left the country. Upon my return the following year, while still planning what I want to do next, I started looking for earning opportunities online (I was online almost the whole day anyway). That’s when I discovered freelancing. I landed my first ever Skype interview. (Long sleeves up top, pajamas at the bottom). It was a 3.5 month project that earned me around 3x my bank salary. I then decided to help run our family business. But the idea of earning from home never left me. I can’t do freelancing anymore because I had a fixed 9-5 schedule already. I needed something more flexible that I do on my own time where I can be my own boss. That’s when the idea of blogging came to mind. That’s how much I was able to earn in almost 2 years of blogging. I was so focused on writing blog posts, getting social shares and building leads but forgot to actually start selling. That all changed when a Canadian friend & I did a promotion for his new ebook. If my audience buys his ebook from me, I’ll get a commission. That’s my first exposure to affiliate marketing. Long story short, I sent out an email sharing an video training I did with him and promoted his ebook at the end. That’s when my world changed. It was a whopping... $8! (but felt like a Million). I ended up making $123 from the entire promotion. But more importantly, it changed the way I approached blogging. One can only earn from... selling. Yes, that dirty “S” word. But if there’s one thing I learned from my first sale online -- it doesn’t have to be. In fact, my audience was so happy when I promoted that ebook to them that people kept asking if it was available. That’s when I realized that done the right way -- selling can be the best service you can give to your audience. What’s The Right Way to Sell? There are a couple of core elements - relationships & trust. Listen, people LOVE buying stuff but they never like to be sold to. But if someone they know & trust recommends something because they know that this person has their best interest at heart, they’re all ears. Personally, the best way to cultivate trust and relationship online is through the combination of emails and storytelling. This powerful combination is what allowed me to achieve things I’d never imagined in my short online career. two clients have been added to my client list. "I joined Allan’s email marketing bootcamp to boost the online presence of my accounting business. Since the beginning, Allan has guided me from giving suggestions for my website up to running facebook ads to grow my list. What I really love is that even after the bootcamp, Allan is there to guide us and to answer our questions. Since then, two clients have been added to my client list. 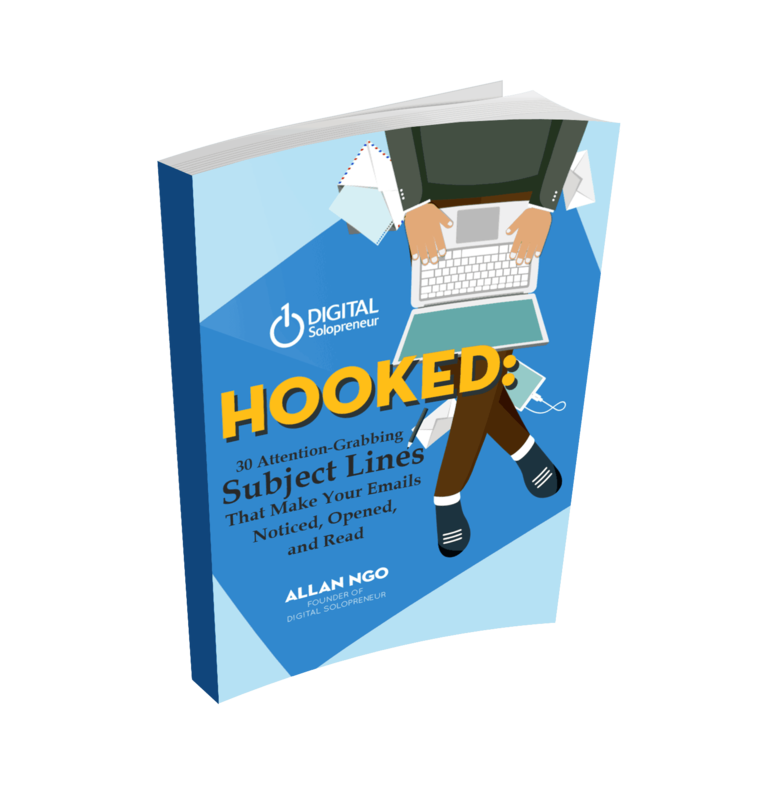 I owe this to Allan and the email marketing bootcamp." I wouldn't have succeeded in my first online course without his timely advice. "Allan is the real deal. In the launch of my first online course, Allan was the number 1 affiliate, bringing in about a quarter of the total number of enrollees for my course. Allan has brought immense value to his followers that they reciprocate by following his advice and taking action." "In fact, it was Allan who convinced me to invest in an email marketing service and to create campaigns to nurture and build my list. I wouldn't have succeeded in my first online course without his timely advice." I have been blogging for 3 years now but I can’t seem to monetize my blog until I came across this guy who lent me some of his precious time when I asked him for some insights. I thought it will only be like a normal chit-chat but it turned out to be 2 hour training. I followed his advice and in 2 days I had a sale in an affiliate program on my blog. Napakadaling kausap, hindi ka mahihiyang magtanong. Thanks Allan Ngo for the BIG help. I have always believed that email marketing will never die, as long as people check their emails. I tell this to my team in Blogapalooza, and give them Allan Ngo's DigitalSolopreneur.com as one of the main information sources for materials and useful tips. I personally recommend following Allan's blog and subscribing to his entries. I have subscribed to Allan's blog for quite some time and have learned quite a handful as well, not only in email marketing but also related topics like affiliate marketing, digital entrepreneurship, even financial management! There are only a handful of people that I know in the Philippines that can truly teach you how to market online and Allan is one of them. If you want real results, he's the man.